Be sure you are in the Camera view and that your scene is enabled for 3D. You can also use the Top and Side views for further clarity if needed. In the Tool Properties panel, click the Add Keyframe button. 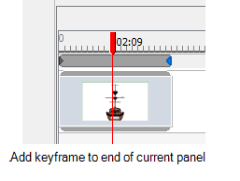 Even if the playhead is not at the start of the currently selected panel, a keyframe will be added to the first frame of that panel. 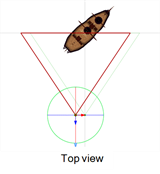 In the Camera view, use the Camera tool and adjust the camera manipulators to change the camera‘s position and rotation—see Rotating the Camera. 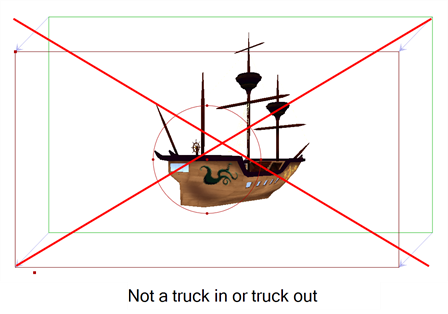 ‣ In the Timeline view, the playhead to the frame on which where you want to place your final camera position. In the Tool Properties panel, click the Add Keyframe button to current frame. For information about the options available in the Camera tool’s Tool Properties, see Camera Tool Properties. 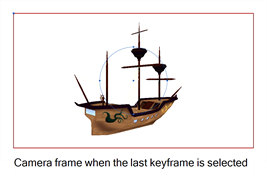 To reiterate, the camera manipulators will only appear in the Camera view if keyframes have been added to a panel in the Timeline and the current frame is the same as the frame of the selected keyframe. 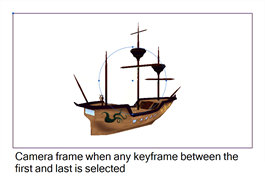 You can select a camera keyframe without moving the playhead. The camera manipulator looks like a circle with four points dotting the circumference and a single point in the centre. If you see arrows in the centre of the manipulator instead of points, you are in the Stage view and not in the Camera view. 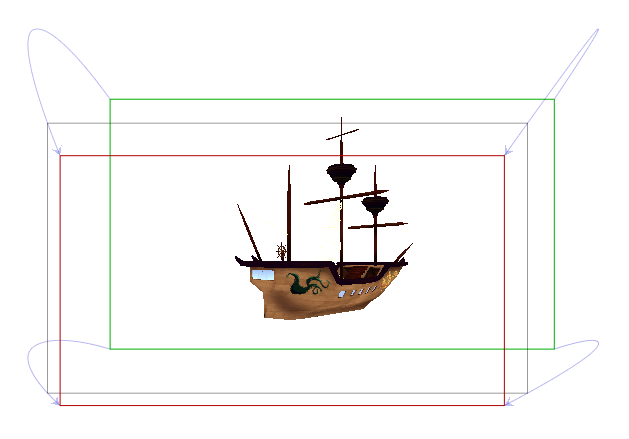 The Stage view is great for viewing your 3D objects in relation to one another, but not as accurate as the Camera view for your storyboard framing. 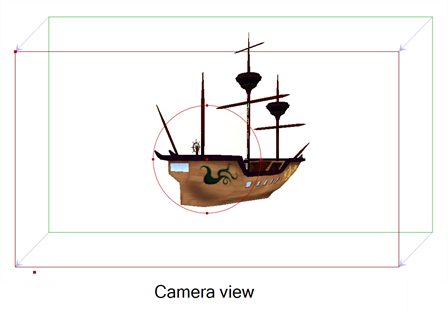 In the Timeline view, if you have the first keyframe of the panel selected, then the rectangle that defines the camera frame, along with a large X that quarters the camera frame, will be highlighted in green. If you have the last keyframe selected, then these elements will appear in red. If you have any keyframe between the first and last selected, then these elements will appear in blue. This colour coding is useful in avoiding confusion when making camera movements. In the Camera view, if you move the camera on any keyframe after the first keyframe, you will see the colour and position of the camera frame of the keyframe before. 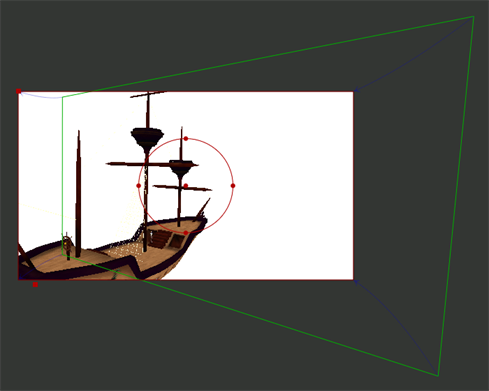 In the example below, the camera was moved down and to the left on the second keyframe. Pale blue arrows also appear to show you how the camera will be interpolated between these two frames. In the following example, it is a diagonal move down and to the left. • By grabbing the camera frame and dragging it to the desired position. • By grabbing the centre of the manipulator and drag them to the desired position. Remember that the pale blue arrows in the Camera view do not necessarily indicate backward and forward movements. 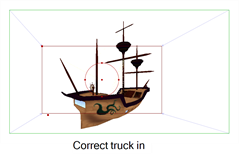 If your second camera frame appears either larger or smaller than the initial camera frame position, then you can be sure that a camera truck in or truck out was made. 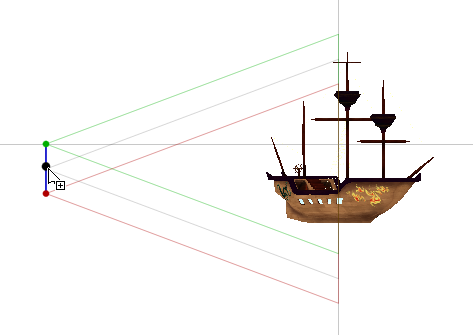 Once you have created an animated camera move you have also inadvertently created a camera path. The camera path is the route that the camera follows from point A to point B, or in this case, from one keyframe to another. By default, this path is always the shortest route from point A to point B, in other words, it is always a straight line. However, you have the option of adjusting the shape of this path, if you wanted to, for example, make this path curved. You can change the shape of a camera path by adding control points to the path. This can only be done in the Top, Side and Stage views, they cannot be added from the Camera view. However, in the Camera view, the pale blue arrows that represent the camera path will change to match the new camera path shape. Go to either the Top, Side or Stage views. 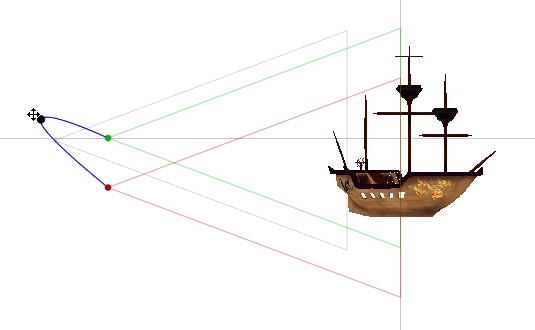 Click the line between the two camera cones that represent the position of the camera on the first and second keyframes in question. A black point appears on the path in both the Top and Side views, as well as on the path between the two keyframes in the Timeline view. NOTE: In the Timeline view, keyframes are represented as diamonds, while control points are represented by circles. Control points change the shape of a path, however, they are not locked in time. Click and drag the black point to the desired location. Notice how the path shape bends and changes depending on the location of the control point. Add more control points if necessary. 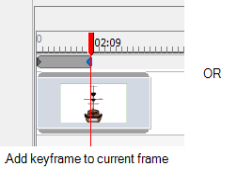 In the Timeline view, drag the playhead back and forth, between the two keyframes, while observing the new camera movement in the Camera view. Make further adjustments where necessary.